Ultrasonic non-destructive testing of components made of austenitic steel is complicated by a structural noise and shape of cracks. For improvement of detection and characterisation of such cracks the ultrasonic synthesised aperture focussing technique (SAFT) may be applied, however efficiency of the SAFT depends on accuracy of the input parameters. In order to optimise the processing algorithms and to estimate the potential possibilities of various NDT methods, the numerical model has been developed. The model enables simulate propagation of ultrasonic waves in materials possessing a granular structure. For computer simulation of granular materials a novel method based on application of Voronoi diagrams was developed. For simulation of cracks fractal theory was applied. Propagation of ultrasonic waves in granular medium was simulated using the ray tracing approach. The performance of the proposed model is illustrated both by the simulated and experimental data. Development of cracks in austenitic steel induced by intergranular stress corrosion is essential factor reducing reliability of pipes used in nuclear power plants. Propagation of ultrasonic waves in such materials is accompanied by strong backscattering, which causes so called structural noise (1,4). Therefore, ultrasonic non-destructive testing of such objects is complicated both by the structural noise and sophisticated shape of cracks developing in this kind of materials (2,3). For improvement of detection and characterisation of such cracks various testing methods and signal processing procedures are used, including split spectrum technique (8), non-coherent filters (6), Wavelet transform (9), neural networks (5), the SAFT (7). However, classical noise reducing techniques, like SAFT, are not efficient in the case of a correlated noise (7). Development of novel NDT methods and optimisation of signal processing algorithms may be simplified using adequate numerical models of the medium under a test and models of the testing method. However, the main attention until now was devoted to development of novel signal processing procedures, but not to adequate models of testing procedures, which are applied in the case of granular materials. In this paper authors describe a numerical model, which allows simulate propagation of ultrasonic waves in granular material and to investigate and estimate different ultrasonic testing procedures and signal processing methods. The essential feature of this model is.2 that is based on physical considerations, like simulation of random granular structure of the material and simulation of propagation of ultrasonic waves in such a medium. Such an approach enables easy to modify parameters of the medium, including ultrasound velocity in individual grains, reflectivity of grain boundaries, which are major factors influencing formation of structural noise. The objective of this investigation is to develop the model, which enables to simulate ultrasound propagation in a random granular medium with stress corrosion cracks of different types. The model should enable to predict a structural noise in the medium also. The structural noise is caused by reflection of ultrasonic waves by grains in the material, however the exact mechanism of formation of these reflections is not clear yet. It is possible to guess that mainly it is due to difference of the ultrasound velocities in different granules, caused by anisotropy of the material and due to different elastic properties at the boundaries between granules. Which phenomenon is dominating in formation of a structural noise is not clear, however the proper model could help to give an answer to this question also. For solution of this task it is necessary to develop five independent models: model of a granular medium, crack model, sound propagation model, model of ultrasonic transducer and model of NDT process. The first step is the generation of the virtual medium with randomly distributed anisotropic granules, possessing different acoustic properties. The complexity of the task is caused by the fact that each granule has its own form cross-section, which is close to some irregular polygon with a random number of corners. 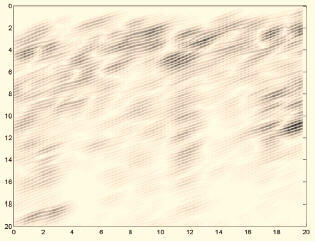 The dimensions of these granules are also random values. For generation of such a virtual medium the method based on the calculation of Voronoi diagram was developed (13,14). The Voronoi diagram is the partition of n-dimensional space with randomly distributed set of m points into m polyhedral regions, which are called Voronoi cells. Each Voronoi cell satisfies the condition that it contains all points that are closer to its data point than any other data point in the set. This feature of the Voronoi diagram makes it especially attractive for simulation of a granular medium. Adjustment of the boundaries of the simulated region to the geometry of the object under investigation. The generated in such a way virtual medium is presented in Fig. 1. The presented example illustrates that the developed approach enables to simulate granular material with a high degree of similarity. Acoustic properties of the material, such as an acoustic impedance and ultrasound velocity, may be set separately for each granule. The reflection coefficients may be selected separately for each boundary of granules also. defines the limits of the branch angle. Examples of a few cracks generated using fractals are presented in Fig. 2. Intergranular corrosion cracks were generated along arbitrary selected boundaries of granules (Fig. 3). Calculation of propagation of the direct ultrasonic beam. In this stage propagation path from the transmitter till the back wall of the object and back through a granular medium is calculated. The branching stage. At this stage each segment of the sound propagation path is "branched" till the selected depth, that is, the complete propagation tree including reflections and transmission at the boundaries is found. The "back to the receiver" stage. At this stage all segments, parameters of which satisfy directivity angle and amplitude limits, are traced back to the receiver. In this case only a transmitted signal is calculated at the boundaries taking into account the diameter of the transducer. where aR is the reflection angle at the boundary, a0 the reflection directivity pattern set as parameter depending on the wave length, KR0 is the reflection coefficient selected the same for all boundaries inside the object. At the output of the model we obtain the set of amplitudes and the delay time of the ultrasonic beams, which reach the receiver. In general this set may be treated as the impulse response of the object under investigation. Convolution of this impulse response with the transmitted signal gives the waveform of the received signal. Such a modelling enables to simulate propagation of ultrasonic wave along a single ray, including multiple branching of this ray at the boundaries of granules. The ultrasonic transmitter /receiver with finite dimensions was simulated by the set of the acoustic rays transmitted from the group of the points on the transducers surface and the reflected back signals were integrated over the aperture of the ultrasonic transducer. Performing such calculations for different positions of the ultrasonic transducer, the complete NDT process is simulated and results are presented like typical B-scan images. The results of such modelling are presented in Fig.4. 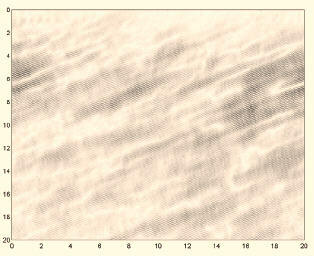 The B-scan image was obtained simulating scanning of the granular medium presented in the Fig.1, 3, using 4MHz, 45° degrees longitudinal wave.6 probe. For comparison experimental B-scans were acquisited on the 25x40x30mm steel sample with a granular structure using a similar ultrasonic probe (Fig.5). The results presented in Fig.4 and 5 demonstrate a very similar character of a structural noise. The approach described enables to investigate formation of a structural noise depending on the reflectivity conditions at boundaries of cells taking into account influence of ultrasonic transducer parameters. Fig. 4. The simulated B-scan image of a granulated medium; average size of granules is 1.7mm (the dimension of the region are given in mm). The influence of structural noise is only one factor affecting detection of stress-corrosion cracks. Another one is the sophisticated shape of cracks possessing a branched structure, which causes a quite diffused reflection. For investigation of ultrasonic signals reflected by such cracks, the approach based on the transducer diffraction model was applied. The model developed enables to take into account direct reflection, specular reflections from the bottom and mode conversion signals (10). For the sake of simplicity, simulation results presented in this paper were performed neglecting structural noise. The simulation set-up is presented in Fig. 6. The transducer model corresponds to the 45, 2.3 MHz, 10 mm diameter shear wave probe. The simulation results are presented in Fig.7. In Fig.7a the ordinary B-scan image is presented in which specularly reflected and crack edge diffraction signals can be seen. The B-scan corrected according to the geometry of the object (10) is shown in Fig.7b. The presented example illustrates possibilities of the developed model to simulate reflection of ultrasonic signals from surface braking cracks caused by stress corrosion. The developed numerical model enables simulation of propagation of ultrasonic waves in random granular materials with cracks caused by stress corrosion. For computer simulation of a granular medium a novel method based on application of Voronoi diagrams was.8 developed. Various cracks were simulated by fractals, what enabled to generate cracks possessing branchy character. Propagation of ultrasonic waves was modelled using the ray tracing approach taking into account multiple reflections between granules. That enabled to investigate formation of a structural noise. The performance of the proposed model was verified by experiments. J. Moysan, G. Corneloup, "Ultrasounds back-scattering measurements for new anisotropy indicator construction", 15 th WCNDT, Roma, 2000. S. Ahmed, R.B. Thompson, "Effect of preferred grain orientation and grain elongation on ultrasonic wave propagation in stainless steel", in Review of Progress in Quantitative Nondestructive Evaluation, Vol.11, edited by D.O. Thompson and D.E. Chimenti (Plenum, New York, 1992), pp.1999-2006. S. Hirsekorn, "Directional dependence of ultrasonic propagation in textured polycrystals", J.Acoust.Soc.Am. 79 (5), May 1986, pp.1269-1279. J. Saniie, T. Wang, N.M. Bilgutay, "Statistical evaluation backscattered ultrasonic grain signals", J.Acoust.Soc.Am. 84(1), July 1988, pp.400-408. J. Spanner, "Neural networks for ultrasonic detection of intergranular stress corrosion cracking", NDT.net, Vol.5, No.07, July 2000. Nondestructive testing. Handbook. Ultrasonic testing. Vol.7. American Society for Nondestructive Testing, 1991, pp. 580-756. V.L. Newhouse, N.M. Bilgutay, J. Saniie, "Flaw-to-grain echo enhancement by Split-Spectrum processing", Ultrasonics, vol.20, Mar.1982, pp.59-68. M.C. Robini, I.E. Magnin, "Application of the Wavelet packet transform to flaw detection in ultrasound B-scans", IEEE Ultrasonics Symposium, 1995. R. Raisutis, L .Mazeika, "The simulation of ultrasonic imaging in the case of the objects with a complex geometry", Ultragarsas, No.1. (38), 2001, pp.46-53. F.E. Stanke, G.S. Kino, "A unified theory for elastic wave propagation in polycrystalline materials", J.Acoust.Soc.Am. 75(31), March 1984, pp.665-681. A. Lhemery, "Impulse response method to predict echo responses from targets of complex geometry. part I: Theory," J.Acoust.Soc.Am. 90(5), Nov. 1991, pp.2799-2807. C. B. Barber, D.P. Dobkin, H.T. Huhdanpaa, "The Quickhull Algorithm for Convex Hulls," ACM Transactions on Mathematical Software, Vol. 22, No. 4, Dec. 1996, pp. 469-483. F. Aurenhammer, "Voronoi diagrams- a survey of a fundamental geometric data structure", ACM Computing Surveys 23, 1991, pp. 345-405.